Various metal threads for goldwork are cut into pieces and sewn onto the ground fabric like beads. For example, bullions and purls (check, smooth, and rough) are applied in this fashion. The pieces are often cut in advance, and then sewn on as you go. You can see a good example of this when I started applying the chip work the goldwork pomegranate I embroidered last year. I usually work on a velveteen or velvet mat, and I’ll usually put the mat inside whatever basket or tool box or any other thing with sides on it that’s at hand, so that I can pick up the mat with the cut pieces on it, and hold it next to my work surface. But you know, the idea of having something a little more permanent – especially something that closes and keeps the already-cut gold threads secure – has preyed on my mind off and on. I decided to concoct my own goldwork tray, one that was small enough to be comfortably holdable, and that could close for storage when putting a project away. I looked around, and up and down, throughout the house, thinking I might find some kind of small plastic tub, shallow, with a lid that fit. The fridge yielded nothing stored in plastic tubs, but when foraging through my needlework stuff, I came across the tin in the photo above, in which I usually store magnets. It’s slightly less than half an inch deep and a perfect size for holding securely in the hand. It’s not the most attractive tin in the world, but I think I paid about fifty cents for it at a craft store, so hey. It works! 1. Tin – or a small shallow plastic tub of some sort, that can be closed securely. 2. Velveteen – I’m using a double-backed velveteen (it’s velveteen on both sides) because that’s what I had, but any cotton velveteen will do. You can use velvet if you want, but it doesn’t cut with neat edges as well, and it’s a lot stretchier. When cutting goldwork, incidentally, I prefer a dark background, like black or deep red, so that the gold pieces show up easily against it. 3. 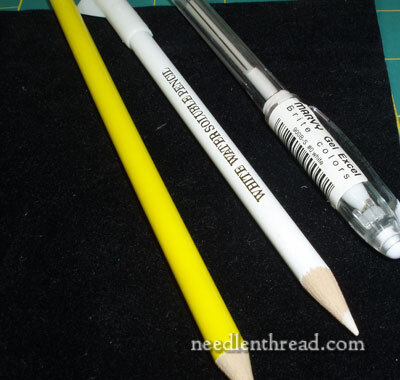 A light-colored fabric marking pencil or chalk, so that you can see the lines you draw on the velveteen. 5. Strip glue (used for paper crafts) or double-sided tape, or even craft glue and a paintbrush. 7. 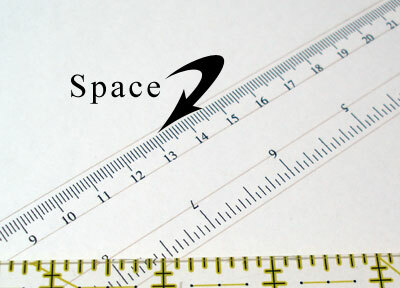 A printed ruler (on cardstock) – more on this below! The first step was to trace the outline of the base of the tin on the dark fabric. Angle your pen or pencil into the tin as you trace. Cut out the shape, along the inside of your traced lines. I still had to trim up the shape a little bit, so that it covered the base of the tin all the way to the edges. 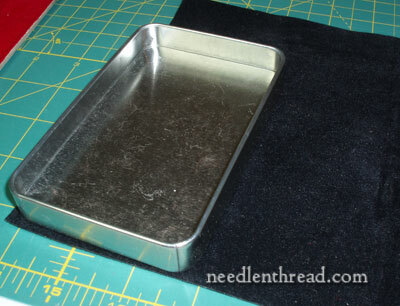 Next, place the lid of the tin on the fabric, top down, and trace an outline of the lid. 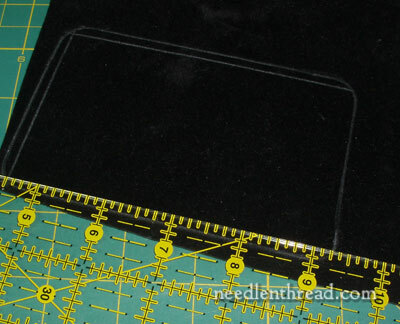 Then, using a ruler, make another set of lines an eighth of an inch inside the tracing. The idea here is that you want the lid to close on the tin as it normally would. If the fabric lining the lid extends all the way to the edge, the tin may not close securely. So I took an extra eighth of an inch off all the way around. 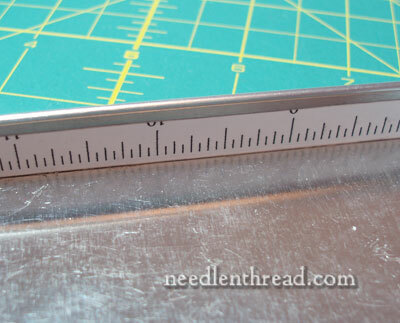 Once you have the lining for the lid cut out, it’s time to move on to the paper ruler. I found this paper ruler online and printed it out on card stock. I drew two sets of lines on each side of the ruler, so that I could cut out measurements in centimeters and measurements in inches. 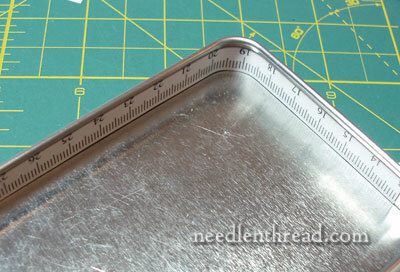 I left a tiny space on the outside edge, between my cutting line and the printed ruler, so that the measurements would still be visible above the velveteen lining inside the tin. There’s about 1/16th of an inch there, and I cut out strips that were about 3/8″ wide. 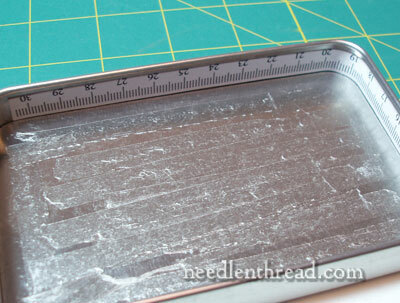 You’ll want to measure the inside of your tin, to determine how wide to cut these measuring strips. Now, I didn’t really care about the numbers on the measurements – I really just want the markings to be visible. I knew the numbers would end up upside down on the centimeter side, and that they would actually be cut off on the inch side, but that’s ok. We’re not after numbers here. 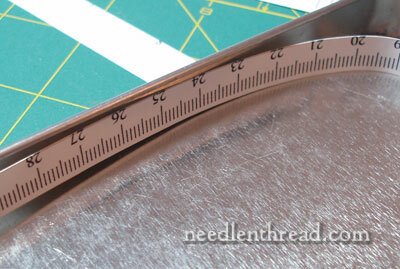 Just markings to use as measurements, if necessary, when cutting the pieces of metal thread. Fit the number strip inside the edge of the tin. I lined one long side and one short side with centimeter markings, and one long side and one short side with inch markings. For adhesive, I’m using this strip adhesive, which is good stuff, and very easy and convenient to use. If you don’t have anything like this on hand, a good glue stick, double-sided tape, or even a slightly diluted craft glue and a pain brush will all work fine. Here’s the centimeter strip, glued in place. 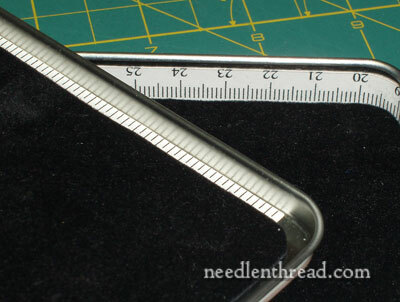 And here’s the inch strip. 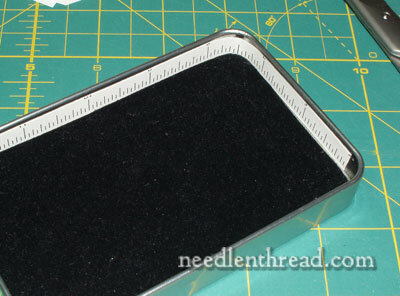 Now, situate your cut lining into the base of the tin, and make sure that it fits well. You want it to extend to the sides – like wall-to-wall carpeting – without any gaps, if possible. It’s very important that if you do have a gap, the edges of the lining are glued down, but no adhesive extends onto the uncovered part of the tray. You don’t want your gold bits sticking to the base of the tray, or getting stuck underneath the lining! To adhere the lining, I covered the base of the tray with adhesive, and placed the lining on top lightly, adjusting it first before firmly pressing it in. Once I was sure it was where I wanted it to be, I rubbed the lining in firmly with my fingers, all the way around the edges and in the middle, making sure there were no bumps or buckles. You can see that the lining goes right up to the centimeter marks, which are visible above the fabric, thanks to the little space left when I cut the ruler out. Now it’s time to move on to the lid. 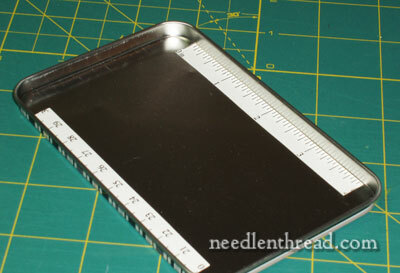 I glued down two more bits of the ruler on the long edges of the lid, with the measurement markings towards the outside. Then I checked to make sure that the lining fit inside the lid. There’s about an eighth of an inch gap all the way around the lining – enough to show the markings on the rulers and to make sure that the lid closes securely. I used the strip adhesive, making sure that it did not extend past the edge of the lining. I pressed the lining onto the adhesive, making sure it was smooth and pressing firmly all around the edges of the lining, to make sure they were completely adhered to the inside of the lid of the tin. Now I can use both the tin and the lid as goldwork trays, to cut metal threads, and to transport them close to my work while applying them. Even with the handy-dandy tin, I won’t do away with my red velvet mat! I love it. But the tin is great for measuring and cutting metal threads, and for storing extra cut bits when the project is packed away. I bet you can think of other uses for a lined tin like this! Even if you don’t do goldwork, a lined tin with some measuring marks in it might come in handy for other needlework pursuits. Any ideas? What a lovely tutorial. The idea of using a ruler to line the sides is so inspired! I have a similar tin dedicated to beading. 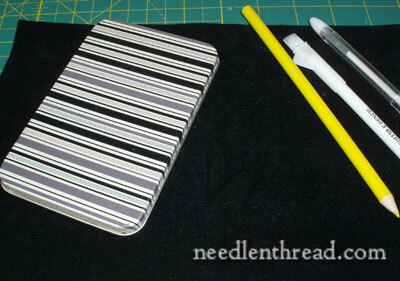 The inside lid is lined with ultra suede instead of velveteen and I use it to hold the beads while working. 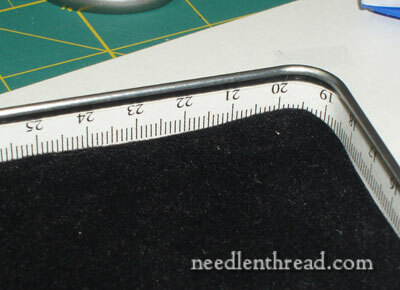 The ultra suede also doubles as a handy needleholder for those tiny beading needles. The bottom of the tin holds the small spools of nymo threads. I enjoy reading your blog every day, I have learned so much from you. You SNEAKY person, you! 🙂 Well done! Hugs and congrats on genius! Wow! This is really posh! 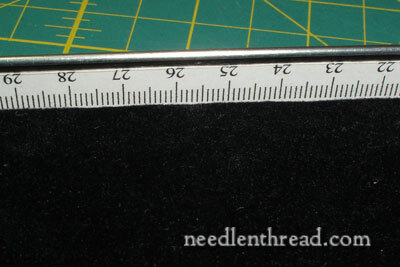 What a brilliant idea to include a ruler for measuring gold thread. It’s always so tricky to measure and then cut gold threads without the bit you cut off flying all over the place. This is a definate improvement! Adding in the measuring marks is just brilliant! 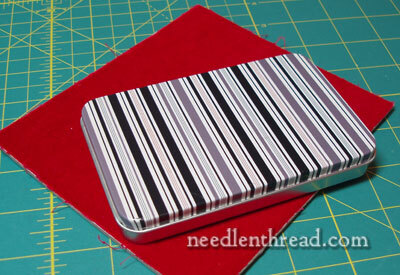 I have a similar tin that I use to transport beads and buttons for embellishing my crazy quilting. I used a sticky back felt in mine. The felt stops the beads from rolling around as I try to coax them onto the needle. I believe the velvet would work better as it has more of a nap. The measuring tape is an excellent addition as well. I believe I will make a new improved version! Hi, All – Thanks for you comments! Yes, Heather, I was thinking of beading, too… but didn’t quite know what the perfect lining would be. I didn’t even think of ultra suede. Good idea! I wonder if that craft foam stuff might work to line a beading tin, too. Hmmmm…. Well, I’m not in for a beading tray just yet, but maybe down the road, I might try it. Pam – you got me. I can’t find the typos that require lots of coffee. Perhaps I just haven’t had enough coffee yet? Kathy – well, you started it! The yogurt lid was a brilliant idea. I’d been thinking of “something” I could use that had markings on it… but when I saw the shallow lid, I knew I had to go shallow. Thanks for the inspiration! Megan – I haven’t tried them yet, but I think they’ll come in handy… I’ll have the opportunity to try them in a little while, so I’ll let you know if it is actually worth it! Yes, beads occurred to me, too. About 8 years ago, AOL was constantly sending out promotional CD’s in flat metal boxes. I horded them as they were excellent for this type of thing! I had taken some LaSage-type embroidery classes and we all needed our “pate” (pronounced as in foie de gras)to cut our metal threads upon. We first, of course, had to make them — which we did by covering an oval piece of mat board w/ velvet and edging it with a thick passementarie piping. I did something similar with an empty baby wipes travel case and with some business card holders. This is a great idea to use for goldwork. Thanks! I made myself a couple of similar boxes to use in beading. 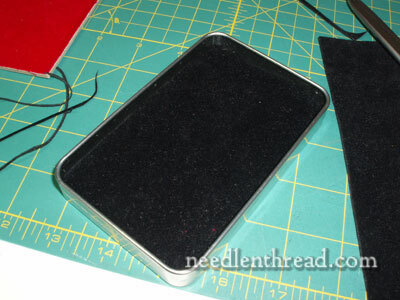 The fabric I used for the lining is polyester fleece, which holds the beads in place well. For one I used a plastic box with square sections in it and cut the fleece to fit the bottoms of the squares, not up the sides, and glued them in. This keeps the different beads in separate areas. A different measuring device I’ve created is with the use of a yellow roll of measuring tape printed on adhesive. I purchased this at my local NWS. I frequently am at the computer looking at instructions or lists of items to use in a project and need to visualize sizes of beads or canvas, etc. So I taped a two foot length of this adhesive ruler to the area at the bottom of my keyboard. Now it is easy to look down and see the measurement I need. Thanks again for the project directions! I have lined tins and Altoids boxes for various storage/working devices. But have to agree, the ruler is genious (I can’t even spell it lol)! Love the idea – thanks for sharing! I love your tool-enhancement tutorials! I’ve been thinking about how to organize my threads lately and this inspired me to poke back through your archives for suggestions. Thank you so much–this is wonderful. I love the additionl of the rulers. And lining the lid, too. Great ideas. I use a small box my Mum lined for me with velvet(I am not great with glue!) to count out my seed beads to stop them rolling all over the place, it makes them easier to see and a lot easier to pick up with the needle. 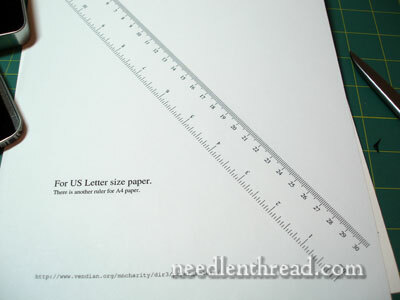 Your idea about the paper ruler inside inspires me, I think I will photocopy my needles and write on the copy what they are so I have a reference for all the “strays” that never end up back in the packet! Beneath you box on the red fabric, is a green board with yellow grids. Can you please tell me the name of this green board. Hi, Helen – that’s called a cutting mat, or a “self-healing” cutting mat, or rotary cutting mat. It’s used under rotary blades (round cutting blades for fabric). I actually use it more often for measuring, or underneath things I’m cutting with a craft knife. They’re available at sewing and craft stores here in the US, but if you aren’t in the US, I would suppose you might find them at fabric stores that sell fabric suitable for quilting. Thanks, Mary! I will look for a cutting mat locally. 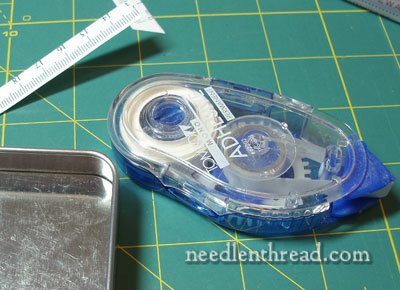 I will use it mostly for measuring and cutting fabric. What a brilliant idea, Mary. And I just discovered it! 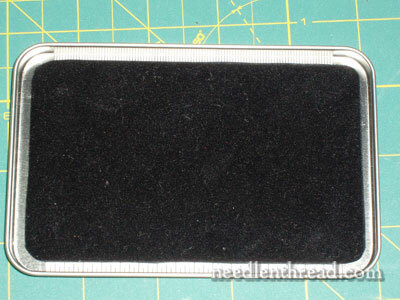 I made a bead embroidery portable kit from a zipper CD case. I ripped out the plastic CD file holders and glued a piece of bead mat down on both sides of the case. I could stick needles into the mat which is thick. The case was a little larger than a CD and fit into my purse. Just finding you after years of not doing embroidery… I LOVE your site!!! I was going nuts trying to find affordable little tins that were about the same size as yours. The Altoids ones were just too small and too deep… BUT Eureka! They sell little tins to put gift cards in at a lot of places. I found mine at Michaels, They are very Christmassy but who cares. I am sure I have seen them many other places (including Home Depot LOL!) They are the perfect size, about 3″ x 5″ x 3/4″ and they are only a dollar or 2. I made 2 of them. One with a sticky bead mat trimmed & stuck to the bottom & one with velvet for my gold work… with your wonderfully brilliant rulers in it! 🙂 Hi, Vikki! I’m glad you found something that works for you. Yes, I love gift card tins for just these types of uses! Next Next post: Goldwork Embroidery Scissors: Slightly Different, but… ?